EL ORIGEN is the first section of the wider project, La Isla. El Origin studies the Origin of the human being and its connection with the forces of nature. Self-knowledge and the interconnection with the 4 elements: earth, air, water and fire represented as well in the different archetypes. The island has always been an archetypal site in visual and literary culture, a place in which man is free to give life to new utopias of regeneration. The island resonates with Shakespearean echoes: we get to it as new Prosperos pursuing a better version of the world we come from, hoping to recover a lost purity in the relationship between man and nature. As he re-creates the world from scratch, however, man often loses control of nature itself. Marco Ferraris’s La Isla is a project in progress, expanding from photography to video, from the dialogue between texts and images, to performance in a wider sense. Ferraris thus gives birth to a multimedia, complex artwork, acting as a sort of travel journal of his artistic research. He keeps coming back to it, enriching it with new insights, time after time. After all, even though the island is certainly a place of stasis, waves break on its shores from all sides. It is, furthermore, a place you can come back to after each journey, bringing something new back with you, each time. The photographic images in this series are structured in an extremely balanced way: they express a sense of stasis. Despite the natural setting, the mise-en-scene prevails, expressing a tension between spontaneity and artificiality. Ferraris has been meditating on these aspects for a long time and has worked on them in Realfiction and in his Passaggi di Tempo, where passers-by are reproduced as clones in their movements and are called to interpret new versions of themselves. A tension between movement and stasis is the organising principle of some of the sets, as, for example, La Mujer Artemisia and Anemoi. Although the female body is positioned at the centre, still and frozen by the camera, reminding other, more static images of La Isla, it seems to be about to expand outside the frame at the same time. In El Vuelo the goddess Artemis projects onto the surrounding space. In Anemoi – Unos, the woman embodies wind energy. The Anemoi represent the Greek gods of winds, coming each from a different cardinal point. The wind breaks up the stasis of the whole photograph. The balance in composition often appears to emerge from the human body, more than that from the surrounding environment. In particular, this can be observed in a set of images in which the human figure is positioned against a corrugated, creased rock, contrasting with the flawless black and white flesh of the bodies, bearing no sign of suffering. The bodies remind classical statues that try to keep a balance within nature, rather than merely reconnecting to it. This is emphasized by the fact that the focus is often at the centre of the image and the lines of composition converge on the human figure. 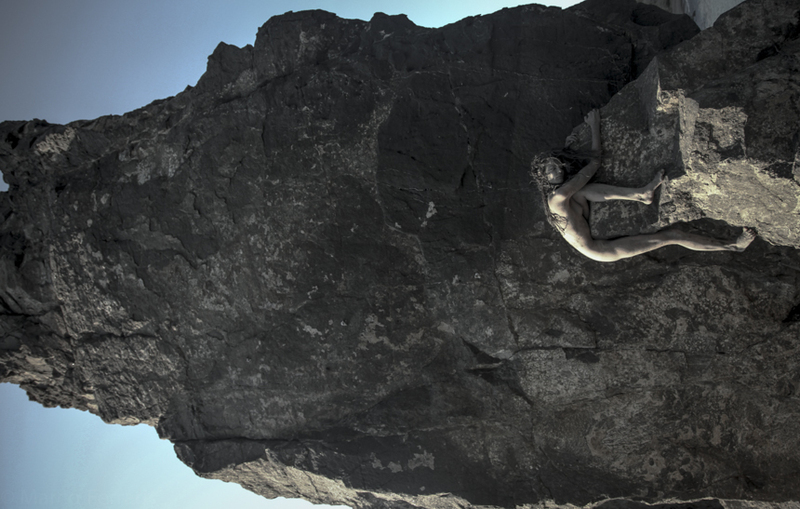 In one case, for example, a man stands in balance on the rock, in a position that evokes the crucifixion. Furthermore, as if to counterbalance the stasis of the photographs, La Isla was recently expanded to video. The island comes to life, naked men and women climb, go up and down from a tree, uttering inarticulate verses, in a sort of Living Theatre-like performance, which, at the same time, evokes the monkeys’ primordial dance in Kubrick’s 2001 – A Space Odyssey. Moreover, movement is often crystallized in La Isla in the staging of symbolic scenes, drawn from the world of painting, rich in biblical, mythological or literary references. It is therefore a journey through a series of essential references in visual culture that the photographer revisits, enriching them with new ideas. The figure of Ophelia, eternalized by John Everett Millais’s painting (1852) has extensively been revisited in photography, especially by Francesca Woodman, who often reproduces Ophelia-like images of the female body, sometimes using it to elaborate on the theme of the double, as well. In Marco Ferraris’s set, Ophelia is further revisited: since there are no flowers, which aresubstituted by veils enveloping the body in water, the girl does not seem to be dead, she simply seems to be floating. The island represents an open space we visit to find new meanings each time. Although we are aware – as Prospero is on his own island – that recreating an uncontaminated microcosm, away from the troubles of the world we come from, is often an illusion, we know that, as Borges writes in his Fragments from an Apocryphal Gospel (used as a comment on the images),“ Nothing is built on stone, everything on sand, but our duty is to build as if sand were stone (41)”.